Secondly, this weather. This week has been glorious. Highs in the low 80’s and mornings in the 50-60’s. Absolutely PERFECT. Of course, if you don’t like the weather, stick around five minutes and it’ll change. Regardless, take advantage of these breezy blue skies because we are too close to that miserable summer heat. We had the most relaxing Friday this week. Caleb and I were both home much earlier than usual so we sat on the patio and enjoyed each other’s company. What made the day even better is that I fell asleep watching Gossip Girl by 9:30. Classic. I have focused on getting more fish into my diet these last few weeks after having a very insightful conversation with a coworker. Salmon is just, the yellow brick road. Especially for pregnant and breastfeeding mamma’s. Lowering our blood fat (triglycerides). Baby development- Nursing mothers are able to pass on the benefits of Omega-3’s to their babies. DHA help with visual and neurological development. Rheumatoid Arthritis- EPA and DHA have been found to lessen joint pain, stiffness, and lowers inflammation. Asthma- Like RA, Omega-3’s assist in lowering the bodies inflammation, a contributing factor in Asthma. We have improved our weeknights by meal prepping casseroles and soups early in the week but regardless of how we cook it, I can’t stomach myself to eat fish from the fridge. I’m not necessarily a “cooked” fish person. I will eat you under the table in sashimi and ceviche but give me 2 day old baked cod or salmon and I’m trading it in for Chipotle. However, this quick salmon dinner saves me in getting these nutrients because it’s so easy to make in the evenings that I don’t feel as if I am working hard in the kitchen. Forewarning- to be honest, I do not opt for “cooked” protein in general. I am a blued/ very rare steak girl which pours over into everything I eat. Although this recipe is 12 minutes, if you’re a well done eater, add 3-5 minutes and radiate in a 15-17 minute dinner. The FDA recommends a serving size of 3 oz but I don’t trust anything they say. While your oven is heating, remove the fish from the packaging and place onto a parchment lined baking sheet. Rub and coat the salmon fillet with one teaspoon of fat. Season the fish with salt and pepper. Place the fish in the oven and cook for 10 minutes. While your fish is cooking, begin to cook your asparagus. For simplicity, add oil, asparagus, salt, pepper, and garlic powder into the skillet at once and cook on medium heat. Cook asparagus for 5-7 minutes rotating them frequently. 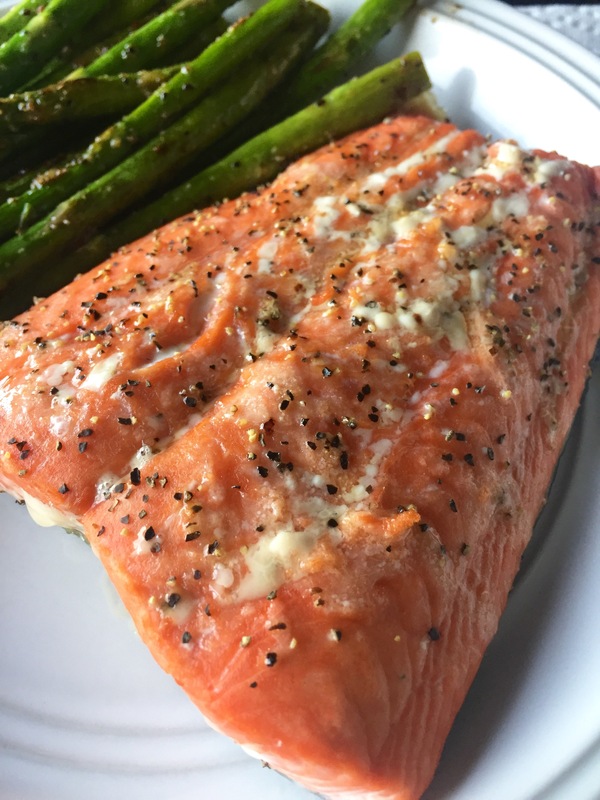 Once the salmon has cooked for 10 minutes, turn your oven to “broil” and continue cooking for 2 minutes. NOTE: If you like your fish well done, continue baking your fish for 3-5 minutes without broiling. Remove from oven and devour! 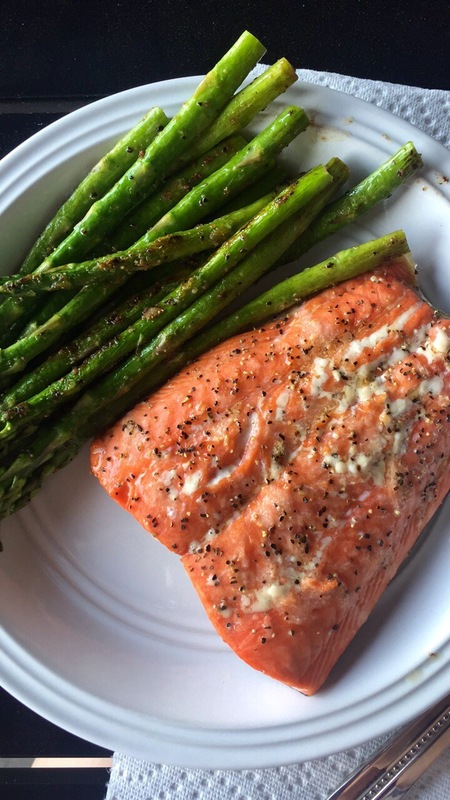 If you’re feeling fancy, sprinkle the juice of a lemon wedge over salmon and/or asparagus. Bonus points- eat outside! You need more vitamin D in your life! Have a wonderful weekend! We are off to the lake for lunch! –Also, after beginning Gossip Girl, I am totally in search of how to bid farewell! –Also, also, to the sweet soul who said “I love your post endings, it’ so Gossip Girl”, thank you for putting this show in to my head. I’m hooked and now add embarrassing narration to my daily life. Poor Caleb. “What’s that? Wholesome Joy has a new post? Didn’t anyone ever tell you it’s impolite not to share? Oh, W.J. We have your back.